The tailgate is a very simple, yet underrated invention. You can open and close it, step up on it, sit on it, put your cooler and drink there, load things into it, walk on it and strap things down to it. It is the ultimate do everything feature on a truck. When the work is done, you pop the tailgate down, crack a cold one and tell lies. If you think about it, that is the only thing a boat is missing - until now. 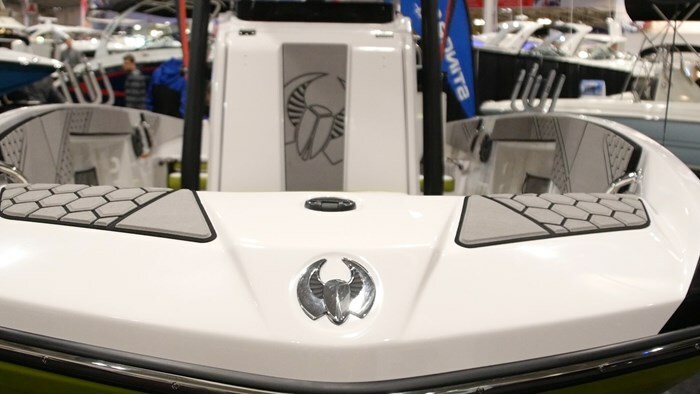 The 2017 Scarab Open 195 features a full, flip down tailgate, very much like what you would see on a truck. With this, they use the saying “Open the possibilities” which is very true. This now opens a whole new world of versatility. 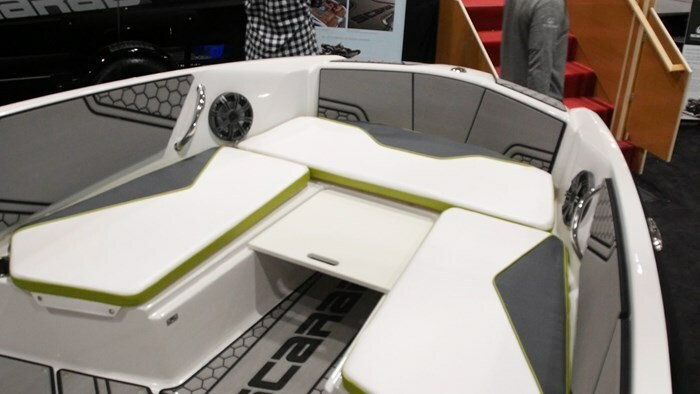 Upon first glance, the Open 195 is a center console jet boat with T top and plenty of seating. If you walked back to the stern of the boat you would see a smaller than average swim platform, and a tall transom that matches the gunnel height of the rest of the boat. Heck, you might even be a little disappointed at the lack of space back there. But then, lo and behold with the opening of a latch on each side that whole transom area drops down on gas assist struts to open up the entire stern of the boat and give you a swim platform that’s level with the water line, add a grab handle to help you get back into the boat and is covered in a soft touch marine matting, great for lounging out on with your feet kicking in the water. The magic of the design is really thanks to the low profile design of the Rotax Jet engine. These engines are the same that are used in snowmobiles and ATV’s which aren’t huge, so you know they’re compact with a powerful punch. They sit low in the hull and have a direct line out to the jet pump, giving you your propulsion. But what this also does is gives Scarab a world of new opportunities, which we have seen here with the new Open 195. Standing at 18-feet 10-inches with an 8-foot beam, the Open 195 is available in standard configuration, as well as a fishing version. I got my hands on the standard version at the Toronto International Boat Show and I was immediately impressed. Obviously the name Open refers to the tailgate, but it really sums up the boat overall as that’s what this boat is, very open. Available in 4 different colour options, I was treated to the Vivid Green version that was proudly on display on the corner of the Scarab booth, with the new tailgate open towards the isles, immediately garnering attention from the passers by. 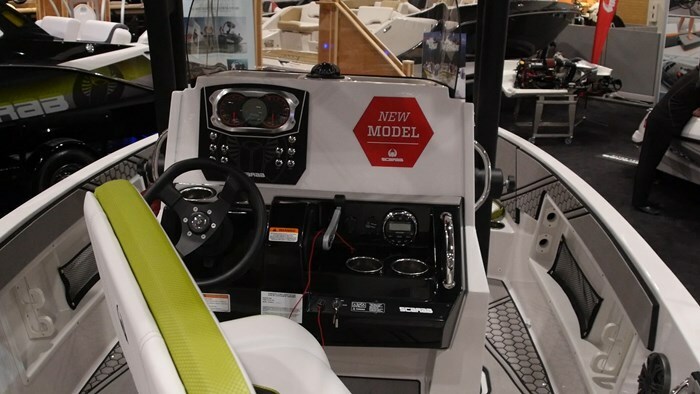 Another new feature for the Open 195 is that this is the first Center Console model the brand has offered in their Jet Boat Series. And yet while these are two drastically new features, this is still very much a Scarab boat. The styling and functionality are very much in line what Scarab has been doing since the inception of this young line of products. The model I walked through didn’t have the sun cushions over the engine hatch, for obvious reasons as many people were walking over it in and out of the boat. 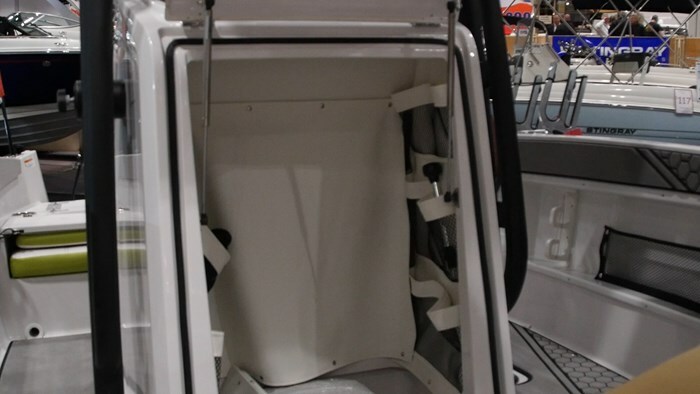 As you enter the boat, the first thing that catches your attention is the large, leaning post style helm seat. This seat is double wide for two people, and if you’re driving you can lean against it as you stand, or you can sit up on it for increased comfort and visibility. Giving this seat a closer look I thought to myself: “it would be smart if this spun around.” I should have known better.. Sure enough, the whole seat can spin around to be apart of the fun that’s happening at the tailgate party. When it’s time to head out on the water and you need a couple extra seats, jump seats will fold up from either side of the helm seat. These are built right into deck, and I didn’t even know they were there until I looked down to see what was there. What I mean by that is as I stepped on them into the cockpit with my 200 pound frame, I didn’t feel them dip or bow at all, so you know they’re built to the Scarab standard of quality. 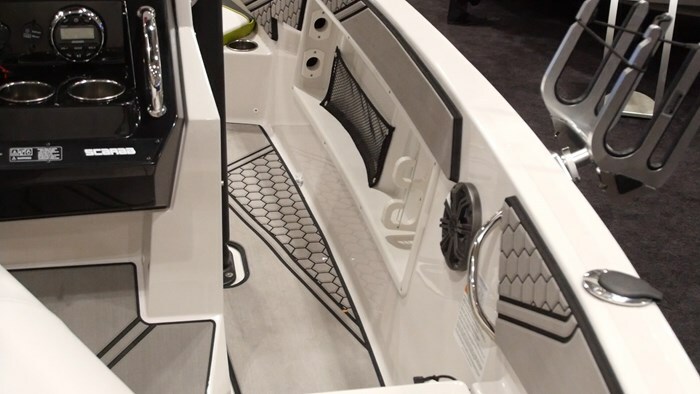 When you look at the helm if the new Open 195 you would think they have been building center console boats for years, which technically they have. 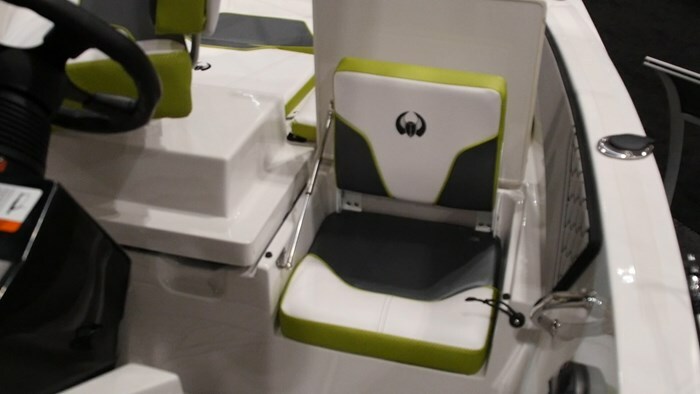 Even though this is the first center console Jet Scarab, they still have a whole offshore division with multiple center console models, so they were able to pull from that experience when designing this one. Directly forward of the tilt steering wheel you will find the gauge cluster with toggle style switches. To the right of that is a large, open surface that you can flush mount any electronics you might want to have, of any size. On top of the helm console there is an inset tray with marine matting that you can toss items like cell phones and sunscreen in. Both these items and yourself will be protected from the elements from both the high wind screen, along with the bimini top attached to the large T-top that hugs the console. Marine matting is used throughout the boat in a couple different ways. 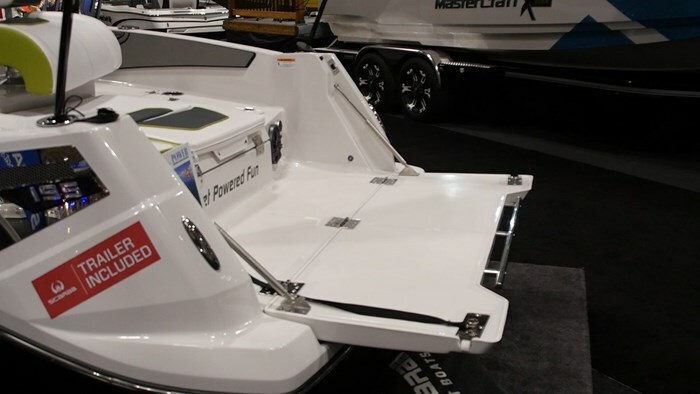 It snaps into the flooring to give your feet some comfort while moving about the boat. It’s also used as coaming bolsters as well as on the exterior of the boat for styling. It’s a unique play on textures and colour that Scarab has become synonymous with. Moving forward to the bow section of the Open 195 you will see a very social concept with a jump seat forward of the console along with U-shaped seating in the bow. 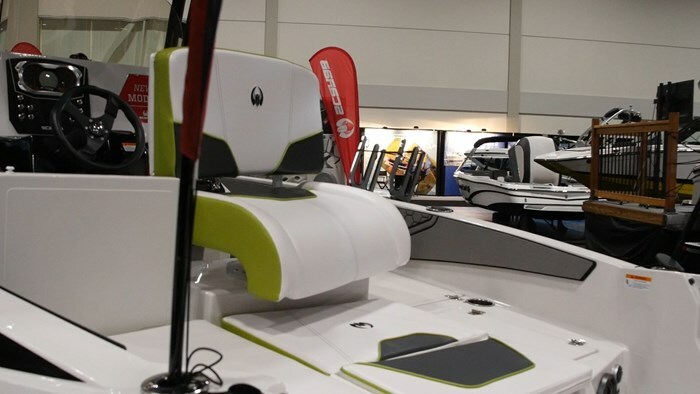 A lot can happen up here as you can cruise the lakes with this layout, or you can pop in the center filler cushion and catch some rays on the new sunbed. Or you can put the table in and have some drinks or play cards. If you want to fish you can remove those cushions and stand right on the deck without putting any wear and tear on your vinyl. Where things get really cool, is the front side of the console actually hinges up and open with a large privacy curtain, giving you a large change area and you can also put a head in there. It’s a boat that has continuous surprises that left me very impressed. I like when boat companies take risks and try new things. It’s what keeps the market fresh and keeps customers engaged. If I were to foreshadow I would imagine we will start to see more models added to the Open line-up, as they will probably go bigger, and I think there might even be room for a 17-foot version of this model. 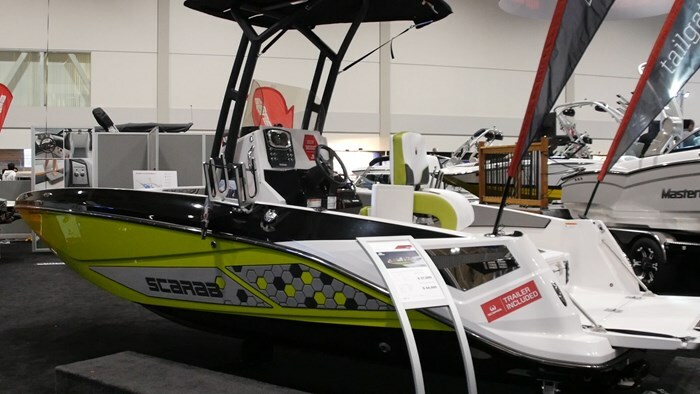 But in the meanwhile, pop the tailgate down, kick your feet in the water with a cold drink and open yourself up to the possibilities of the Scarab Open 195.